true Success. Destroys token during parse. Definition at line 251 of file Parsing.cc. References Ip::Address::GetHostByName(), NULL, port, Ip::Address::port(), Ip::Address::setAnyAddr(), and xatos(). Referenced by logfile_mod_udp_open(), Log::TcpLogger::Open(), and parse_IpAddress_list(). Parses an integer value. Uses a method that obeys hexadecimal 0xN syntax needed for certain bitmasks. self_destruct() will be called to abort when invalid tokens are encountered. Definition at line 142 of file Parsing.cc. References DBG_IMPORTANT, DBG_PARSE_NOTE, debugs, i, int, ConfigParser::NextToken(), self_destruct(), and xatoll(). Referenced by dump_kb_int64_t(), parse_icap_service_failure_limit(), parse_int(), parse_refreshpattern(), parse_wccp2_service(), parse_wccp2_service_info(), ConfigParser::ParseBool(), ClientDelayConfig::parsePoolRates(), Rock::SwapDir::parseSize(), and Fs::Ufs::UFSSwapDir::parseSizeL1L2(). Parse a 64-bit integer value. Definition at line 126 of file Parsing.cc. References ConfigParser::NextToken(), self_destruct(), and xatoll(). Referenced by parse_int64_t(), and ClientDelayConfig::parsePoolRates(). Parse a percentage value, e.g., 20%. The behavior of this function is similar as GetInteger(). The difference is that the token might contain '' as percentage symbol (%), and we may further check whether the value is in the range of [0, 100]. For example, 20% and 20 are both valid tokens, while 101%, 101, -1 are invalid. Definition at line 172 of file Parsing.cc. References DBG_CRITICAL, debugs, ConfigParser::NextToken(), p, self_destruct(), and xatoi(). Definition at line 199 of file Parsing.cc. References ConfigParser::NextToken(), self_destruct(), and xatos(). Definition at line 211 of file Parsing.cc. Referenced by free_access_log(), and DelaySpec::parse(). Definition at line 231 of file Parsing.cc. Definition at line 24 of file Parsing.cc. References DBG_IMPORTANT, DBG_PARSE_NOTE, debugs, NULL, and self_destruct(). Referenced by parseBytesLine(), parseBytesLine64(), parseBytesLineSigned(), and parseTimeLine(). Definition at line 43 of file Parsing.cc. References DBG_IMPORTANT, DBG_PARSE_NOTE, debugs, int, self_destruct(), and xatoll(). Referenced by ConfigureCurrentKid(), GetPercentage(), mainHandleCommandLineOption(), Store::Disk::optionReadOnlyParse(), ACLRandom::parse(), ACLMaxUserIP::parse(), Security::PeerOptions::parse(), parse_access_log(), parse_icap_service_failure_limit(), parse_peer(), parse_refreshpattern(), parse_wccp2_service_ports(), and parseBytesOptionValue(). Definition at line 75 of file Parsing.cc. References DBG_IMPORTANT, DBG_PARSE_NOTE, debugs, self_destruct(), and xatoll(). Definition at line 89 of file Parsing.cc. References DBG_IMPORTANT, DBG_PARSE_NOTE, debugs, NULL, self_destruct(), and strtoll(). Referenced by GetInteger(), GetInteger64(), MessageDelayConfig::parseResponseDelayPool(), xatoi(), xatol(), and xatoui(). Definition at line 108 of file Parsing.cc. References DBG_IMPORTANT, DBG_PARSE_NOTE, debugs, port, self_destruct(), and xatol(). 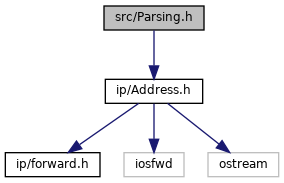 Referenced by GetHostWithPort(), GetService(), GetShort(), ACLIntRange::parse(), parse_port_option(), parsePortSpecification(), and MessageDelayConfig::parseResponseDelayPool(). Definition at line 57 of file Parsing.cc. Referenced by parse_port_option(), and Helper::ChildConfig::parseConfig().